Grimm at work heckling the enemy. Monday, Dec. 7 is an important day for Baseball Fans and historians everywhere. The Veterans committee will announce which, if any, executives, umpires and managers will be inducted into the HOF in July 2010. Billy Martin, a manager who won everywhere he went, may be elected. Danny Murtaugh, a manager who directed the Pirates to STUNNING World Series Championships in 1960 and 1971 may go in. Gene Mauch, who managed over more victories than 99% of all managers but did not win a Pennant or a World Series also stands tall on the ballot. And then there is Charlie Grimm, a man with an outstanding record as a Manager, a professional hitter with 2299 hits, and 35 years in the Chicago Cubs organization. Grimm took the Cubbies to three World Series, winning none, but establishing himself as the best Chicago pilot before or after Frank Chance. He was in the dugout in the 1933 World Series when Ruth supposedly called his shot. There are those who maintain that Ruth was pointing to Centerfield and telling pitcher Charlie Root that the next one was going to fly out of Wrigley Field. 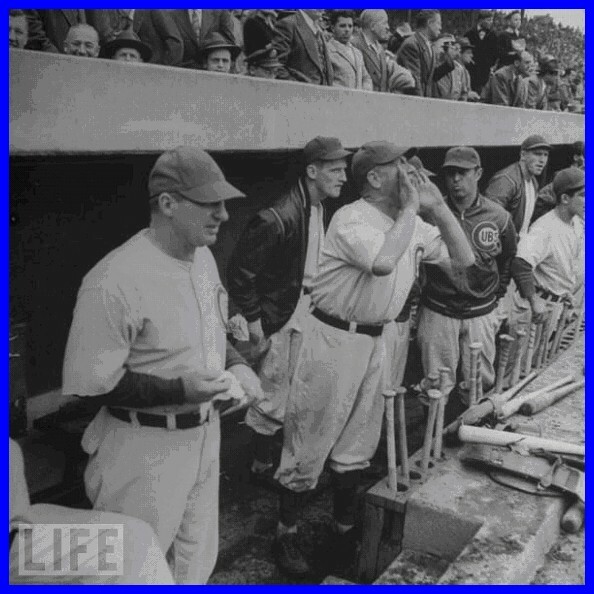 Grimm maintained that the Cub bench had been riding “the big monkey”, insinuating a thing or two about Ruth’s heritage, and Babe was merely pointing his bat toward Root and telling him he would be out there soon to turn him inside out. Charlie was also present in 1961 when the Cubs unveiled their College of Coaches, he being one of 11 Managers who sequentially rotated through Wrigley and the minor league outposts to develop the talent, one of the craziest episodes in MLB history. Charlie was “traded” for a broadcaster in the 50’s, Lou Boudreau taking his place in the dugout while he ascended to the booth. Charlie was tight with Bill Veeck, and was on hand as the Master Hustler planted Ivy on the Wrigley walls after the big bosses’ new shrubbery died. Charlie was also on hand in 1933 when the Cubbies passed on picking up the PCL contract of a kid named Joe DiMaggio. Can you imagine how the Cubs would have done with Joe D. on the roster ? Joe DiMaggio played 13 years, registered a .325 BA, got 2,214 hits, 361 HR’s and had that 56 game hitting streak. Joe went into the HOF in 1955, 4 years after he retired, with 88.5% of the vote. Had Joe played for the Cubs, had he not won all those pennants and Championships, what year would he have made it into the HOF ? Gee, Riggs Stephenson has a .336 career B.A. in 14 seasons and he isn’t in the HOF. Most of us do not know who he is. Then again, Riggs didn’t play for the Yankees. He played mostly for the Cubs. We’ll never know how long Joe D. would have waited to go into the HOF had he been a Cub. But what we do know is that the HOF is located just a three hour car ride from NYC, an international media capital. When it comes to getting in, the bar is set a little higher if you played or managed in the Midwest. And it’s set a lot lower if you played in NYC. Grimm is an icon in Chicago Cubs lore. We Easterners are largely ignorant of him. Whether he goes in or not, he has three pennants in his back pocket and handled the most talented, and craziest, group of Cubs ever. Don’t be surprised if he goes in.